December 10, 2009 - Since the dawn of civilization people have formed tribes, and research demonstrates that humans are genetically programmed to form into groups. Within every company there are tribes, often several, consisting of 20 to 150 people who know each other and work together. But while everyone tribes, the culture of each tribe is different, as is its effectiveness. Improving a tribe’s culture—and its chances for greater success—requires a tribal leader who not only understands the tribe but can leverage its collective assets to build a greater team. Atlanta Refrigeration Service is proud to present that Zappos.com has partnered with the authors of Tribal Leadership to bring you the audio version of the book for free! 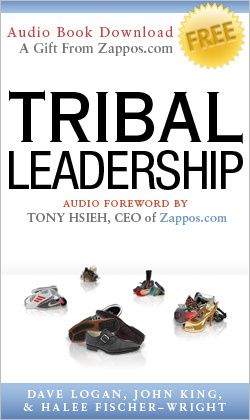 We've included a special audio foreword featuring Tony Hsieh, CEO of Zappos.com, having a conversation with Dave Logan, co-author of Tribal Leadership. We hope you enjoy the audio book! Tribal Leadership is part of the management and leadership part of the USC Executive MBA, which was ranked #1 in this area by the Wall Street Journal.